Just curious, and apologies if this is a dumb question, but what is the disadvantage of using deblur with 480i? Why deactivate it? I don't believe 480i games actually use the horizontal blur. If I'm right, with the de-blur on you'd be removing picture information. The N64 stock is awful. I never owned one until rather recently because of how blurry it was. now im kind of interested in an updated version of the N64RGB that might get designed with de blur in mind. When I detect 480i I disable the de-blur because I believe all 480i games use a 640x480 buffer without the blurring. Would it be possible to post a couple of full screen comparison images of the filter on and off on a CRT? As mentioned above, in 480i you will lose information. The N64 initially outputs 320x240 pixels in 240p mode, which is filled up to 640x240 pixels with the blur effect. In 480i you will have 640x480 pixel resolution where one would remove horizontal information with the de-blur feature activated. I can't see much difference at all between those pictures? I notice a difference between say the very top and the very bottom images. I just don't really know what each corresponda to. In the post that Borti linked too, each set of images just looked brighter to me. But if you scroll up on that same German thread there are some additional pictures and you can see that some images are 'clearer' than others. Not sure if they are testing the same feature as I can't read German but what they're doing looks promising. Some of the GameShark users were claiming slight increases in frame-rate with the Aliasing turned off. MikeJ or Borti did you'll notice the same too? This isn't deactivating the blur filter, just removing its effects. So it wouldn't lead to a framerate increase like turning off the AA. I received a lot of emails about the N64RGB recently! It will be back in the shop in a few days, with the anti-blur feature added (switchable). 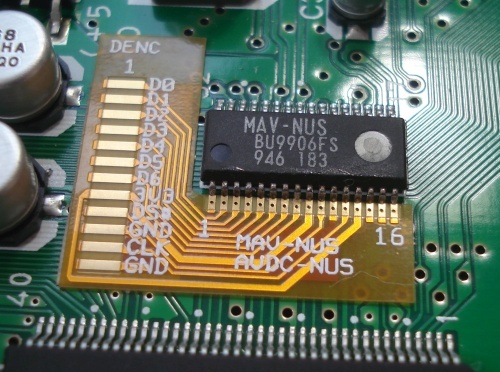 All versions of N64RGB hardware have the same programming header as the NESRGB so the anti-blur feature can be added with a software update if you have the Byte Blaster programmer. Anyway, I have the new version of N64RGB hardware ready. It's basically the same as the old one with some extra solder pads. Inspired by the flex-cable from the Ultra-HDMI, I thought I'd have a go at making a flex adapter board to mate with the fine pitch DAC chip. It turned out very well indeed. There's some double sided tape on the back. Just stick it down, solder to the DAC pins, then solder a standard 1.27mm ribbon cable to it. It's ten times easier than the previous method. Notice that the Sync-, R-, G- and B-information are outputted in a serial manner. Unbuffered means that the information is given directly to the R2R-ladder. So one can see a slight discolering at edges (can be best seen at the "A" - left edge red/yellow, right edge cyan/blue). Buffered means that the information is 'collected' before outputting everything together to the R2R ladder. By comparing with and without de-blur (i.e. picture 1 with (3 and 5)) one can see that the letters and the red heat of Mario are sharper with the de-blur feature. Amazing work Tim! The flex cable will be a humongous benefit- when I was looking at doing it for my newer N64 I saw that even modders selling their services didn't want to install an N64RGB on the finer pitch chip. Even I should be able to handle it now! There doesn't happen to be a US distributor for the N64RGB, is there? Is it strange that I want to RGB mod an N64 even though I have no affinity for the system, don't own one, and don't really care for many of its games? I feel the same way Einzelherz. I never really liked the n64. Mostly because of how blurry it is. In the 90s I bought a Saturn instead and have always been a Saturn guy. But now, With this board with the De-blur, I also Find myself wanting to Install one. So is it available? Sounds like it's available from what you are saying. How do I order? Thanks. What is the link for the shop so I can keep checking? I was on my phone, but yeah I should have included that as well. That new revision looks awesome! Sounds like it might finally be time to get my N64 modded. I feel like I'd buy two or three games for it and never really play it. I just like tinkering. Then if someone who really liked it came over, I'd be all, "you wanna see how AMAZING Beetle Adventure Racing can look!?" Will make the installs much more fun. The suspense is killing me Tim, have mercy! My favourite 90's console. I own around 30 games. Will definetly do this mod at some point. Will it be switchable using a key combination on the controller or is it something you basically have to choose on or off when you install the mod?